Before she married my grandfather, my paternal grandmother was Vivienne Isabel Wing. Born in Rumford, Maine in 1903, six generations after Simeon Wing (1722–1794) and his family had traded Sandwich, Massachusetts for the wilderness of New Sandwich, Maine (incorporated as Wayne in 1798), my grandmother was proud of her Wing ancestry; at times, she lamented that as an only female child she would be the last in her long line to bear the name. Had my grandmother not been a woman of a certain generation she might have at least “kept” her name. Instead, she became Mrs. John Whorf. I remember writing thank you notes to her for gifts and being reprimanded by my mother if I addressed the envelope to Mrs. Vivienne Whorf. It was not, I was instructed, the way a married woman should be addressed. Back then, on the day they married, women relinquished part of themselves, part of their identity. I really only heard the Wing name when my Dad spoke of his grandfather, Artemas Ward Wing, a public school teacher, and when he expressed his mother’s lament. My Wing (Winge) ancestry dates back to the Rev. John Wing and his wife, Deborah Bachiler, the daughter of Rev. Stephen Bachilor who, as a man of about seventy years, arrived in Saugus (now Lynn), Massachusetts with his third wife aboard the William & Francis in 1632. In his Great Migration sketch on Stephen Bachiler, Robert Charles Anderson traces the New England residences of a man who, as he writes, “led a most interesting life, filled with unusual twists and turns far beyond the norm.” From Saugus, Bachiler went to the plantation of Yarmouth, then to Newbury from whence he and other families went to Hampton. By late 1650 or early 1651, Bachiler, then near ninety years of age, had returned to England, where he died in 1656. They were among the sixty families who went to Sandwich, following the Ten Men of Saugus, those pioneers who, in 1637, were granted “sufficient lands for threescore families” by the Colony of Plymouth. Though an 1881 genealogy of John Wing notes that Deborah Bachiler, her husband John Wing, and three adult sons arrived with Stephen Bachiler in 1632, Mr. Anderson contends that Deborah Wing, widowed, arrived in New England with her sons, Daniel, John, and Stephen, in the late 1630s. They were among the sixty families who went to Sandwich, following the Ten Men of Saugus, those pioneers who, in 1637, were granted “sufficient lands for threescore families” by the Colony of Plymouth. Sandwich, on the opposite end of Cape Cod from Provincetown (where I grew up spending my summers), is one of my very favorite places. Whenever I am driving home from anywhere on the Cape, I get off the highway at Exit 3, Quaker Meeting House Road, and drive past the Wing Fort House on Spring Hill Road where my great-great-great-great-great-great-great-great-great-grandfather, Stephen Wing (ca. 1621–1710) lived with his first wife Oseth Dillingham, my ancestress, and later his second wife, Sarah Briggs. The house, built in 1641, was acquired by Stephen in 1646 and was lived in by his descendants until 1942, when it was sold to the Wing Family of America (WFA). It is now a house museum, open to the public during the summer months. From Spring Hill Road, I loop back onto scenic Route 6A and wend my way to Route 130 and the Bayview Cemetery, where I stop for a visit with my great-grandparents, Artemas Ward Wing (1878–1964) and Nina Hierlihy (1881–1936). The second Mrs. Ward Wing, who was nearly thirty years his junior and four years younger than my grandmother, is also buried there. The sight of the headstone with the three names never fails to put a smile on my face as I hear my Dad telling me, in his forthright way: My mother hated that woman. Recently, I returned to my Wing family tree, where a name that had not meant anything to me just a few years ago caught my eye. It was that of Capt. Noah Wiswall (1638–1690), my great-great-great-great-great-great-great-great-great-grandfather, born in Dorchester, Massachusetts in 1638 to Thomas Wiswall (1601–1683) and Elizabeth Burbage (ca. 1607– ca. 1668). Noah found his way into the Wing family in 1752 when his great-granddaughter, Mary Wiswall (1731–1800), married Samuel Norcross (1729–1800). Samuel and Mary were the great-grandparents of Jesse Pierce Wing (1817–1875), whose parents were Dr. Samuel Wing (1792–1876) and Mary Norcross (1796–1869). They were my grandmother’s great-great-grandparents. I wondered if there was a connection between Noah and a woman named Hannah Wiswall, who married the Rev. John Robinson (the Duxbury minister, not the Pilgrim preacher), and whose sorrowful story I had researched a few years ago while preparing a booklet for the Provincetown Cemetery Commission. Indeed, Hannah’s father, Rev. Ichabod Wiswall (1637–1700), minister at Duxbury beginning in 1676, was Noah’s older brother. While it is always gratifying to connect the generations, to neatly fit individuals together in an unbroken chain and reveal the common associations among what seems to be a disparate group of individuals (six degrees of separation), it is the stories of those individual lives – if one can find a story – that humanize our ancestors beyond names and dates. While some of us are fortunate to own a treasured object (with a story of its own) that has passed through the hands of our ancestors, for others the heirloom is the treasured tale itself. And who doesn’t love a good story, albeit a sad one? While it is always gratifying to connect the generations … it is the stories of those individual lives – if one can find a story – that humanize our ancestors beyond names and dates. Hannah Wiswall was born in Duxbury in 1682 to Ichabod and his second wife, Priscilla Pabodie (Peabody). Through her mother, Hannah was the great-granddaughter of Mayflower passengers John Alden and Priscilla Mullins. In January 1705/6, Hannah married the Rev. John Robinson, her father’s successor. The couple had eight children, seven of whom lived to adulthood. Their eldest, Mary, was born at Duxbury on 23 February 1706/7 and baptized 13 April 1707. Their last child, Ichabod, was born 12 December 1720 and baptized 14 May 1721. Mary Robinson’s gravestone. Note that sixteen-year-old Mary is referred to as Mrs. This usage for unmarried women, common through the eighteenth century, is now obsolete. On 22 September 1722, Hannah and her daughter Mary, then sixteen, were on a passage from Duxbury to Boston (about 30 miles) when their small coastal vessel was caught in a storm off Nantasket, the original name for Hull. Both Hannah and Mary drowned in the turbulent sea. 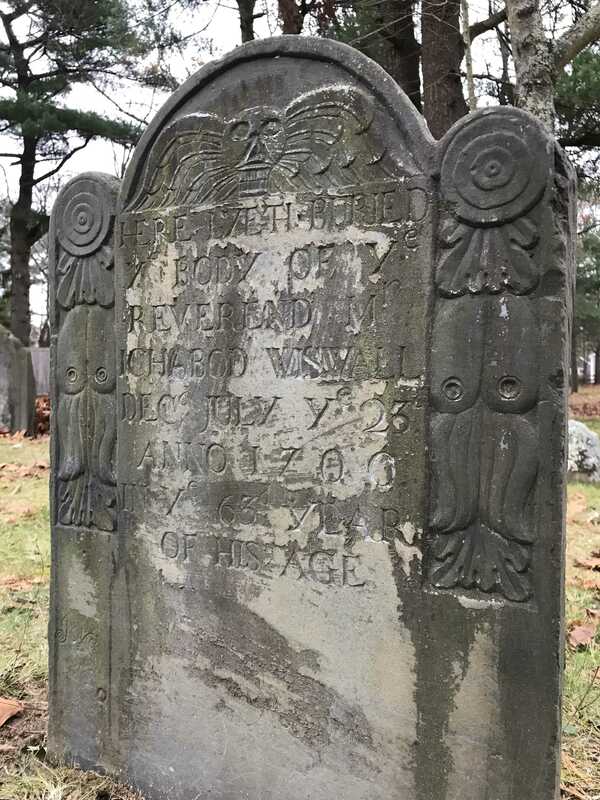 Mary’s body was soon recovered and she was buried, near her grandfather, Ichabod Wiswall, in Duxbury’s Old Burying Ground; her headstone was inscribed with the first line (slightly misquoted) from Psalm 107: 30: Then are they quiet, because they are at rest. 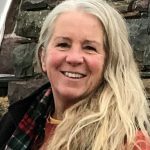 Hannah was not recovered until six weeks later, when her body washed up at Provincetown near the present-day Herring Cove. She was identified by papers tucked in her stays (corset) and by a necklace that was concealed by her swollen neck. A finger had been cut off to remove a gold ring. In his family record, as shared by Edward Robinson in his Memoir, the bereaved Rev. John Robinson noted that his dear wife Hannah had been “decently interred the next day, Oct. 31, 1722.” She was buried in the Old Burying Ground (now Winthrop Street Cemetery) in Provincetown, where a monument was placed by her husband on her grave, inscribed with the second line from Psalm 107: 30: Thus he bringeth them into their desired haven. As noted by Edward Robinson in his Memoir, the monument had been renewed twenty years earlier (1839) by Hannah’s grandson, the painter John Trumbull, who found it partially hidden by drifting sand, but by 1857 it had disappeared. Whether it had been completely covered by the overflowing sands or removed was not known. 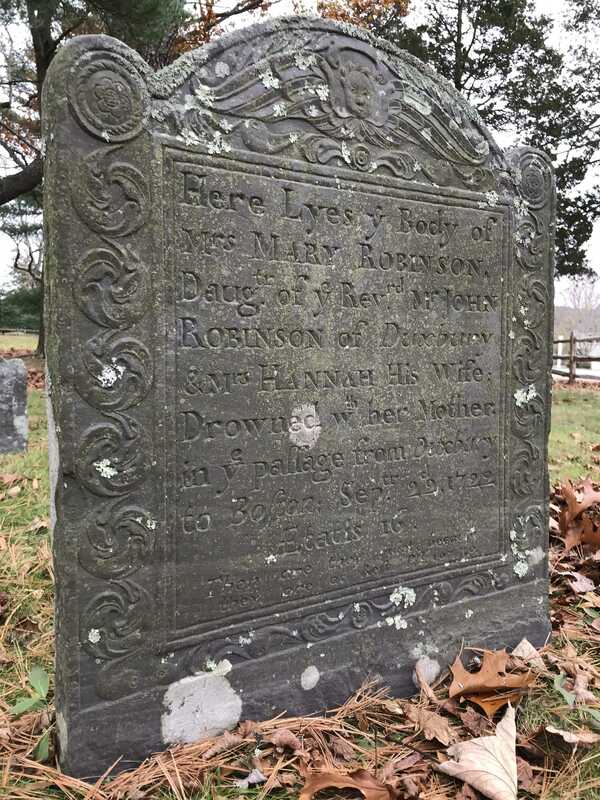 One story, related on her deathbed by a woman who lived opposite the cemetery, told of two young men, off a sloop from Duxbury and possibly working on behalf of the Robinson family, making an inquiry about the stone sometime around 1850. Not long afterward, the stone was missing. In 1857 and 1858, the Rev. Osborne Myrick, pastor of the Congregational Church, made several attempts to locate the monument by digging and sounding, but without success. Mr. Edward Robinson had pondered the overflowing sands and utter desolation of the cemetery, remarking: “Would that the generation of the living had more respect for the habitation of their ancestral dead!” All these years later the whereabouts of Hannah’s monument remains a mystery. It so happens that when Artemas Ward Wing took a teaching position in Winthrop, Massachusetts, my grandmother Vivienne took a fancy to a classmate whom she later married. His roots were deep in those overflowing sands of Provincetown and that is where they made their home, raised their family and are buried, within view of Hannah’s final resting place. Robert Charles Anderson et al., The Great Migration Begins: Immigrants to New England, 1620-1633, 3 vols. (Boston: New England Historic Genealogical Society, 1995), 1: 61-69. Rev. Conway P. Wing, D.D., A Historical and Genealogical Register of John Wing, of Sandwich, Mass. and His Descendants, 1632–1888 (New York: The De Vinne Press, 1888), 19. Rev. Anson Titus, “The Wiswall Family of America,” The New England Historical and Genealogical Register 40 : 58–62. Edward Robinson, Memoir of the Rev. William Robinson (New York: John F. Trow, Printer, 1859), 24–25. Ibid., 26. Frederick Freeman also relates portions of this story in the Provincetown chapter of his History of Cape Cod, Annals of the Thirteen Towns of Barnstable County, 2 vols. (Boston: Printed for the Author by George C. Rand & Avery, 1860–62), 2: 615–50. Isn’t it great that women can more easily keep their maiden names now when they marry. T’wasn’t always so. When my wife and I went for a marriage license in Providence, Rhode Island in 1973, she wanted to keep her family name since she was a third-generation newspaper reporter/editor. The City Clerk said that would be illegal. At that time, the conservative Catholic church ruled the state along with the Mafia and a few old RI families. So we hired a young female lawyer there who specialized in family law. I still have her long research report and brief which showed that Rhode Island was a common law state, and common law precedent there holds that “you are whomever you choose to call yourself, as long as you do it consistently, continuously, and without intent to inflict pecuniary damage.” She retained her maiden name, the clerk relented when presented with the brief, and the story made headlines on the “Marriages” page. Our lawyer married a year after and kept her maiden name also, then went on to become Chief Judge of Rhode Island Family Court. We still joke about “doing pecuniary damage” whenever we disagree about a major household expenditure. Despite your ancestor’s traditional name change at marriage, you have done her a great service in posting her and your family’s history. Well, you certainly have a lot of cousins who can find you now…including me. Stephen Bachilor’s namesake grandson, Stephen Hussey, was a legendarily cantankerous early settler of Nantucket, and my 8th great-grandfather. Beautifully told – events which were tragic for our ancestors sometimes become the vehicles through which we can glimpse the stories of their lives. A single incident in which an young Irish immigrant cousin in Connecticut, reported in an 1896 newspaper as killed by a train provided insight into his family and life I would never have gotten otherwise. I was reading your article and when I came across Wiswall I said to myself that sounds familiar. I found in my tree an Isabella Barbage married to a Thomas Wiswall. Then she married a John Farmer in Billerica and they had my ancestor Edward Farmer in 1641. She died in Billerica in 1683. As I recall I got this from the History of Billerica. It was very confusing and this is what I think it said. Are these people related to yours? The name Wiswall was familiar to me also. Esther Wiswall, Thomas’ daughter married William Johnson. Rebecca Wiswall, daughter of John Wiswall who Savage said was Thomas’ brother married Matthew Johnson (my 7th great-grandparents) William’s brother. I have no surname for Elizabeth the first wife of Thomas Wiswall. (my 8th great-grandparents.) He married Isabel (Burbage) Farmer as his second wife about 1674. Is there new information on his first wife’s parentage? Love the Cape. I spent summer vacations in Wellfleet (where my father’s grandmother was from) and then for a number of years my husband and I had a summer home in Harwich. Hannah is a 1st cousin 9x removed of my daughter-in-law, Renee Wicks Boehnlein. I am working on getting her and her brothers and father into the Mayflower Society before 2020. thanks for this story which I will add to the Alden tree. Amy- I enjoyed your article. My parent’s lived in East Sandwich for 30 years, not far from Spring Hill Rd. I too, get off at Exit 3 and drive thru the same area for old times sake. Last summer my daughter married a young man from the Dillingham family. His branch of the family made their way to Northern, NY but originated in Sandwich. I plan to share this with Patrick.